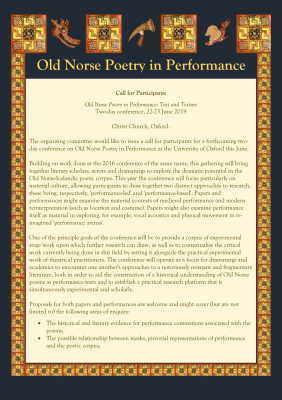 The organising committee would like to issue a call for participants for a forthcoming two-day conference on Old Norse Poetry in Performance at the University of Oxford this June. Building on work done at the 2016 conference of the same name, this gathering will bring together literary scholars, actors and dramaturgs to explore the dramatic potential in the Old Norse-Icelandic poetic corpus. This year the conference will focus particularly on material culture, allowing participants to draw together two distinct approaches to research, these being, respectively, 'performance-led' and 'performance-based'. Papers and performances might examine the material contexts of medieval performance and modern reinterpretation (such as location and costume). Papers might also examine performance itself as material in exploring, for example, vocal acoustics and physical movement in re-imagined 'performance arenas'. One of the principal goals of the conference will be to provide a corpus of experimental stage work upon which further research can draw, as well as to contextualise the critical work currently being done in this field by setting it alongside the practical experimental work of theatrical practitioners. The conference will operate as a focus for dramaturgs and academics to encounter one another's approaches to a notoriously resistant and fragmentary literature, both in order to aid the construction of a historical understanding of Old Norse poems as performance texts and to establish a practical research platform that is simultaneously experimental and scholarly. - A suitable vocabulary for the discussion of Old Norse poetry and performance. All proposals (abstracts) should fully and clearly describe the topic of the presentation. For individual papers or performances a proposal of c. 300 words should be submitted. Proposals should include the participant’s name, affiliation and contact details. Proposals should be submitted to [email protected] by midnight GMT on 1 April 2019. Late proposals will not be accepted. The conference programme will be announced, and registration opened, in April 2019. The organising committee gratefully acknowledges the support of Christ Church Oxford, Somerville College Oxford, Reverend Productions and Routledge.